Isn’t the captain supposed to go down with the ship? Not here. He survives, and according to the poster, “would be better off dead” for doing so. 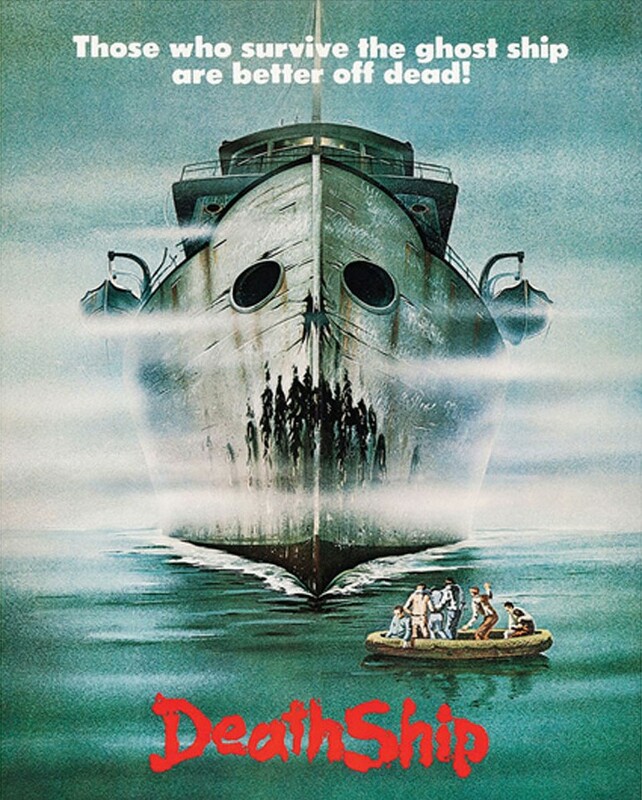 Death Ship, needless to say, is a weird disaster film / supernatural horror-hybrid that is set on the high seas (and by the looks of the insane premise, “high” being the operative word). A sweaty George Kennedy plays Ashland, a bored cruise ship captain whose vessel collides with a mysterious rusted brown freighter. His takes on water, and disappears quickly, leaving but a handful of survivors on a raft. They float about for a bit before coming upon the rust-bucket boat in question, now anchored, and they hop aboard. They go exploring, only to discover that the ship in uninhabited. It’s always a delight to see a bunch of people poking about on an abandoned vessel, which we have not seen since the wacky 90s Italian horror, Creature from the Abyss, aka, Plankton). There’s a ghost in the machine, however, and one of the passengers (Saul Rubinek, the Daphne love interest from Frasier) is hoisted by a crane and dunked/keelhauled to his demise. The survivors realize that something is seriously amiss and they really haven’t been rescued at all. You see, the titular ship has been totally abandoned and is just drifting around as if it’s been possessed by some nefarious spirit. Spoiler alert: It friggin’ has. Even though Death Ship isn’t a slasher, and is as far removed from the likes of Friday the 13th or Halloween as you can get despite coming out during the Golden Era of horror, it still manages to succeed because like those films, there’s a solid understanding that place matters. This entry was posted in Strange cinema and tagged 80s horror movies, Canadian film, Supernatural by Really Awful Movies. Bookmark the permalink.